Action Alert: Methuen City Council to Hear More Testimony for a Resolution in Support of Changing the Massachusetts Flag and Seal – Monday, February 4th at 6:45 p.m.! More public testimony in support of a Resolution of Support for Changing the Massachusetts Flag and Seal will be heard on the third floor of the Methuen City Hall at the next meeting of the Methuen City Council – – – Monday, February 4th. Supporters are asked to gather in the Council room at 6:45 p.m. Please forward this update to friends who live in Methuen. Methuen is the first city to consider the Resolution of Support for Changing the Flag and Seal, so the City Council has the opportunity to set the tone. If you have time and are able, please attend the City Council Meeting in Methuen on Monday Feb. 4th to be in support. City Hall in Methuen is located at 41 Pleasant Street. Parking is behind the building and the lot can be accessed by the road between the city hall and the gatehouse. 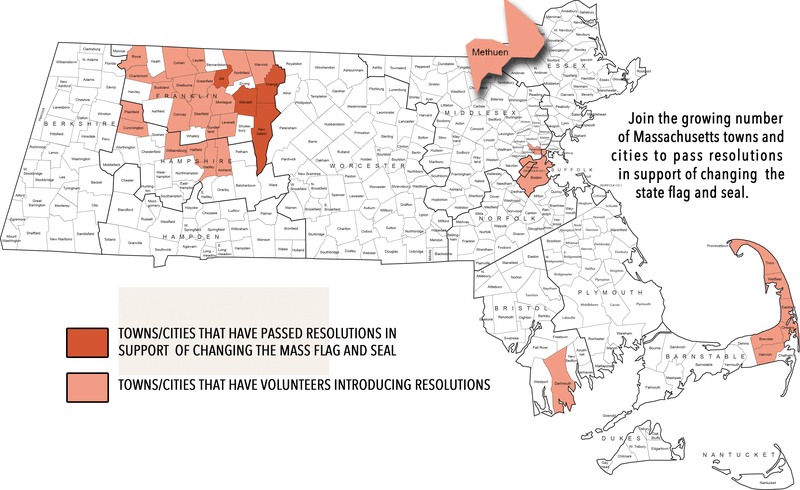 Read the resolution here, and contact the Campaign to Change the Mass Flag and Seal to bring a support resolution forward in your city or town! Next New Legislators Coming Out of the Woodwork to Change the Flag!